Nettuno de Charme Forio, Hotel Italy. Limited Time Offer! With a 21Read more room capacity with categories ranging from the Room to the Room) rooms, the Nettuno de Charme is accessible starting at 81 US Dollars. The Nettuno de Charme is a four star Luxury establishment has all the comforts such as : Restaurant, Room Service, Bar, Front Desk 24hr, Free Parking, Television, Satellite Television.The hotel is located in the north-west section of Forio d'Ischia, at CESOTTA 64, only 5 minutes walking from the city center.Take advantage of the indoor pool which is available at the hotel.High speed internet is available in this hotel.You can reach Capodichino in 80 minutes by car (the airport is 25 miles from the hotel).This hotel offers a unique service : mini-golf.Other useful information:This hotel has a free parking. The Nettuno De Charme offers you an unforgettable holiday in the heart of the Mediterranean. 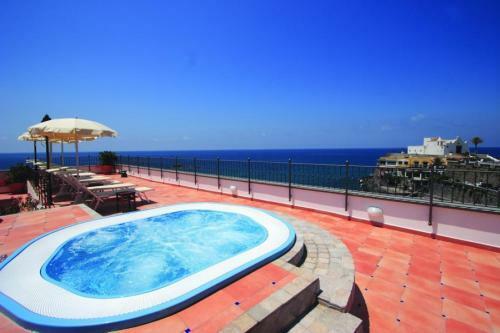 Close to Forio centre, the hotel is also near one of Ischia’s famous beaches.